I studied four semesters of German at university and then I lived in Switzerland for three years. I almost didn’t learn any German at all while living in Switzerland, because I was too shy to speak German with people I’d see more than once and people always wanted to practice their English on me. I never really lost my intention to improve my grasp of the language, though. To facilitate being successful at improving and retaining my German, I purchased the CD versions of beginning/intermediate German using the Rosetta Stone. This software presents everything in the target language, using audio, video, and text. It’s supposed to simulate the way people learned their first language. I actually quite like it, even though it’s a little on the expensive side. I’ve had “improving my German” on my list of goals in LifeBalance for over a year. My goal was to do at least an hour a week. Since purchasing Rosetta Stone in November of 2003, I’ve completed two entire units at level one, comprising 22 total lessons, and I’m a quarter of the way through a third unit. Given that each lesson takes about an hour and I’ve had at least 54 weeks, I obviously haven’t been very successful at doing the hour a week. I’d like to improve my consistency at working on my German and then expand my skills to being able to read things at a Reader’s Digest level. There’s a book called Running On Empty: Meditations for Indispensable Women. I know all about “running on empty.” At one point in my life, I was working fulltime plus for a small, struggling web development agency, teaching part-time to supplement the poor income from the first job, and trying to work part-time on a Ph.D. That’s a lot of time. I was running so far below empty on the gauge that, not only was I on the verge of total burnout, I had stressed and over-worked myself into frequent migraines. Migraines and I were no strangers, as I first met them in my early 20s. This, however, was on a mammoth scale. I was regularly enduring migraines resistant to painkillers up to fifteen days a month. While the magnitude of the pain and frequency fit in well my personal philosophy of, “If you’re going to do it, do it 250%”, I was in a constant spiral of trying to catch up and then working myself into a migraine. Add stress and repeat, as required. I am not going to say that by simply drinking 8 glasses (2 litres) of water a day I miraculously cured my migraines and other ills of my life. That would not be the honest truth. However, I had read many articles on migraines and more than one suggested that, for many people, migraines were often induced by a combination of co-occurring factors. Stress, implicated in so many things, was obviously one factor. Another one was dehydration. Most people simply do not drink enough or drink things, like coffee, which are actually diuretics, causing a loss of water. Although I’m terrible at mathematics and physics, after I read books about the physicist Richard P. Feynman, I wished I could be more like him if I didn’t exactly aspire to be Richard Feynman. Feynman came to public light for many people as he was very much involved in the investigation of the Challenger shuttle disaster in 1986, eventually solving the riddle of what went wrong. Unfortunately, NASA will have to solve their own mysteries in future as Feynman died of abdominal cancer in 1988. What I found most intriguing about Feynman was how he looked at the world and problems in it. Somehow he had a completely different approach from most people, which enabled him to solve problems. Once you understood how he looked at a particular problem, often the solution was also very evident to you, or so recollections seemed to say in the various books and articles I’ve read previously about Feynman. I, too, fervently wish to “Think Different” and I am envious of his highly superior problem solving abilities. As I later discovered, this is classic Feynman in rhythm and philosophy. Nowhere is his down-to-earth manner of thinking and communicating more apparent than in his various collections of anecdotes, such as Surely You’re Joking, Mr Feynman!, What Do You Care What Other People Think?, and The Pleasure of Finding Things Out. The first two I read years ago and are very approachable recollections mostly in his own words of events and people in Feynman’s life. The Pleasure of Finding Things Out is my latest Audible audio book (unabridged) and it is very much like Feynman sitting across the table from me, recounting his adventures in science and teaching. 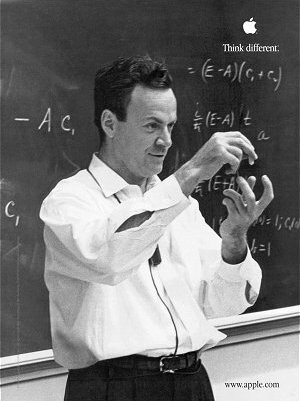 He thought different, he was a curious character, and he thought he should teach: Feynman’s my hero! 1. Photo is of Apple’s Think Different Feynman poster. 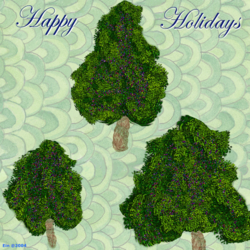 Original poster is copyrighted by Apple Computers, Inc.
2. Druzdel, Marek (1995) “Richard Feynman on Teaching” [online]. Available from: http://www.pitt.edu/~druzdzel/feynman.html [Accessed 2 October 2004]. Today I’ve learned that, if you get enough insect life flying above your head in clouds thick enough to cut with your hands like a knife, the insects make a sound together not too dissimilar to that of high-voltage electrical lines. That’s the way it was on the Waskahegan Trail around Miquelon Lake on Sunday, August 29th. And, with that sound, I was home.